When Anna and Ian were much younger I would put them in the car and tell them to close their eyes for a few minutes. When they asked where we were going I would tell them that we were going on a Magical Mystery Tour. They loved these trips as we explored rock pools at the seashore, mountains, castles, old grave yards and library's and museums were places of interest on the really wet and windy days. The childlike excitement and enthusiasm was great to watch and it is something that I am blessed to still experience when I go off on my adventures today. Last year I spent almost 100 days out of Ireland at various Angling shows/fairs, teaching courses and fishing adventures around the world, and each one I found as exciting and interesting as the next. As the years prance on I have become aware that there is probably not enough of my life left to do all the things I want to do, and to go on all the adventures that I want to go on. There is no time like the present to organise a few more trips, and this time I would like to bring you with me on my Magical Mystery Tours. I will be bringing you to the places that I have already been to before and can therefore answer all the questions that you may have regarding travelling, fishing equipment necessary for the trips, types of accommodation and level of endurance required for each location. In 2019 I will be Hosting trips to Patagonia in March (this trip is full), and Scotland in July. In 2020 I will be going to Patagonia and Scotland and in 2021 I will be going to Greenland and Scotland. There are more details and links later in this newsletter. A lot of these trips are outside our busy times at Blackwater Salmon Fishery and I am blessed that Noel my partner is here to run the fishery when I am not. I am also glad that Noel will be joining me to Patagonia in 2020 and Greenland in 2021. Please contact me if you would like further details on these courses. February 1st is Opening Day on the Blackwater and we would like to welcome you to the start of the new season with a breakfast roll and a fun casting/gear clinic. Spaces are limited to 14 people and the cost is €15. Booking is essential please. March 2nd Double Hand/Spey Casting for improvers including lunch and fishing. The cost is €150 per person. Maximum 6 participants. March 9th Double Hand/Spey Casting for beginners including lunch and fishing. The cost is €150 per person. Maximum 6 participants. June 15th Single Handed Spey/Skagit casting, hitching flies and low water techniques. The cost is €150 per person. Including lunch and fishing. Maximum 6 participants. Last year saw the first of my Scottish Salmon Fishing Courses since I lived there in the mid 90's. Next season we have two more courses to offer. A mixed course of ladies and gentlemen and the second is a ladies only course. Each course has a maximum of 6 people and will be based on learning and improving your salmon fishing skills. These courses are for beginners and improvers and will concentrate on all topics regarding salmon fishing with the fly including double handed rods and single handed. Safety around water, safe wading and correct use of life jackets and wading sticks. All the necessary casts including, Roll, Spey, Skagit, Scandi, and Switch lines. Sinking line work included. Choice of flies and leader material. Knot tying. The life cycle of the salmon. And most of all we are going to have fun. This is a 4 night residential course, with 3 days salmon fishing and teaching by myself on the famous Kercock beat on the River Tay assisted by the Head Gillie Gary Harkin. We will be staying at the Tayside Hotel in Stanley and all meals including lunch is included in the price. The cost of these courses is £900. Arrive at the Tayside Hotel Monday 1st July, fish/learn on the 2nd, 3rd, 4th and depart on 5th July. The ladies only course arrive to the Tayside Hotel on Sunday 7th July, fish/learn on the 8th, 9th, 10th and depart on Thursday 11th July. 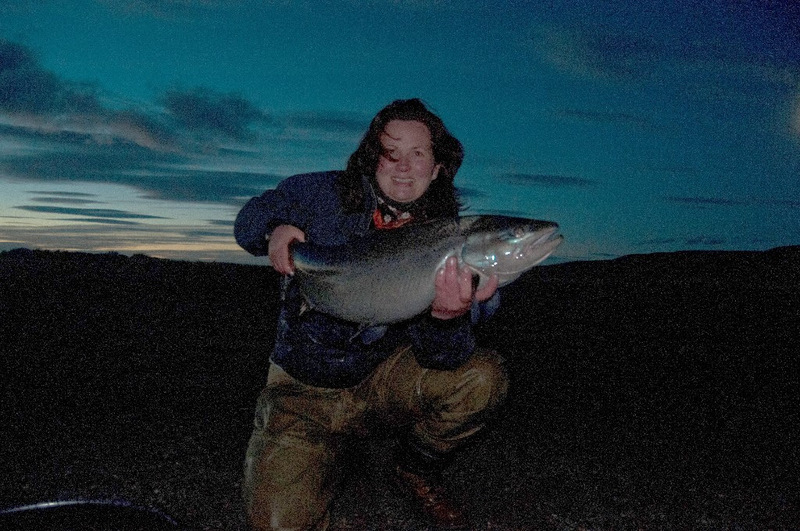 The first photo on this newsletter is me with a large sea trout from the Rio Gallegos in Patagonia and is taken a few years ago when I was staying at one of Solid Adventures camps, Las Buitreras. I will be returning with a group this coming March and this trip is full. The next trip that I will be hosting is in 2020 and I am taking bookings now for this adventure. Words cannot begin to describe this trip, but Mike Blakely who has been there many times before has made a video which is really worth watching and I have copied the link below. 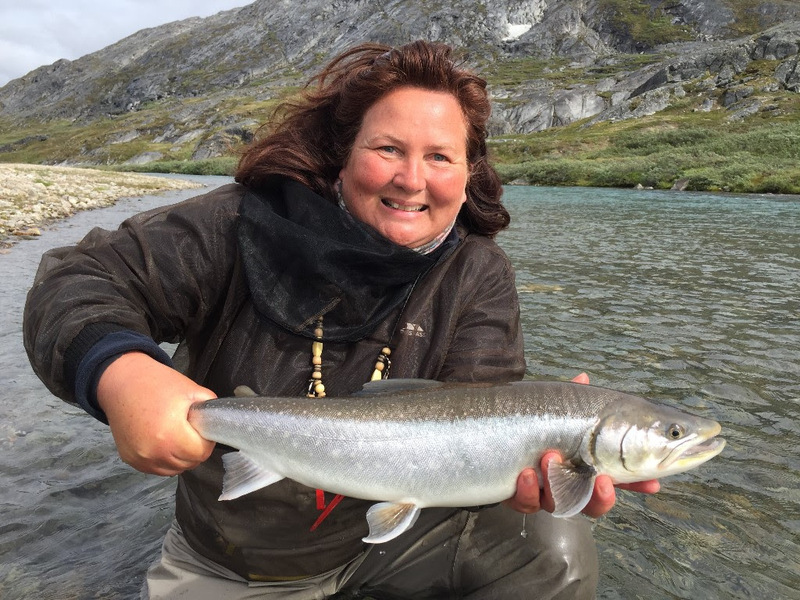 This trip is luxurious, we stay in a lovely comfortable lodge, with fine wine and food cooked by a great chef and we fish for some of the largest Sea trout in the world for 6 full days. Please contact me if you would like further details on this trip. The Kangia River Lodge Greenland. Last July I had the privilege of going to Greenland with one of my clients who over the years has become a very good friend. I had never been to Greenland and the booking was made in January. It seemed like a long time until July but the year flew and I really did not know what to expect and I was so excited about this wonderful opportunity. Greenland is the most remote place that I have ever been to and I found the people welcoming, humble and very friendly. After a few flights, boat journeys and an adventurous journey where we stopped to watch a whale feeding in the fjord we arrived to camp around 2am. It was still light and we were buzzing with excitement. I slept very little that night as the guitar came out and we were treated to some wonderful music by some of the people running the camp. After breakfast we walked across the mountain to the best part of the fishing approximately 3km from the camp. The walk is a beautiful walk and we watched the Kangia river twisting and turning below. It was brisk with a slight wind and a very welcome 7 degrees celsius. We of course had come from Ireland which was having a red hot summer with most of the rest of Europe and it felt refreshing to have these cool temperatures. I was also recovering from Septicemia and had just got out of hospital 2 weeks before and was grateful that I was able to hike the mountain path - albeit slowly, and reminding myself that a few kgs less body weight would make it much easier. We arrived at the satellite camp and the guides suggested where each of us should fish that day and some people stayed near the camp and others walked further up the river to the waterfall. The fish were late this year and there were not as many of them up the river as there should have been at this time but we had a fantastic time. I caught 29 silver sea run Artic Char and 3 of them over 10lb weight. I don't think that I have ever caught fish that fight so hard, even the smaller ones felt much much bigger on the rod. The wind came up a few days and I was glad that I had brought my Lts Switch rod with me which worked very well throwing the bigger weighted flies. I caught fish on the surface with surface flies and fish with weighted flies and when the fish were there in numbers they were very aggressive. I had the opportunity to walk across the mountain with other people who were part of our group and this experience has made my trip rich with memories from talking to wonderful people, and sometimes I walked alone by choice. Never have I felt so small in this vast world and been aware of the grandness of the universe. It was humbling to think that any problem that I could have would remain very small in this natural setting which has not changed much from the way He made it. I have an extensive PDF for those interested in coming on this Magical Mystery Tour in 2021 and the prices for 2019 will remain the same if we book soon. Here is a clip for you to watch.